From the day it was created in 1947, Magnum Photos has represented some of the most famous names in photography. But the agency’s work also includes more surprising images – pictures of cinema. Cinema Through the Eye of Magnum recounts this remarkable collaboration, from Dennis Stock's portraits of James Dean to Eve Arnold’s intimate relationship with Marilyn Monroe. 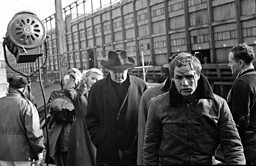 The Magnum photographic agency was formed in 1947 by four photographers - Robert Capa, Henri Cartier-Bresson, George Rodger and David "Chim" Seymour - who had each been scarred by the Second World War. Formed as a photographers' cooperative, it was designed to allow its members to work outside the formulas of conventional magazine journalism. The agency would manage a photographer’s work while they were out in the field. Capa was already a famous war correspondent, having photographed the WWII fighting in Africa, Sicily and Italy, and prior to that the Spanish Civil War. 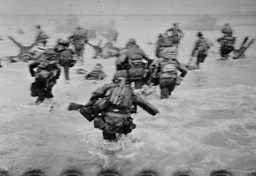 His surreal, movie-like images of the D-Day landings at Omaha Beach would inspire Steven Spielberg, who opened Saving Private Ryan with images replicating those photos scene by scene. 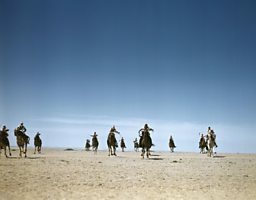 In a scene reminiscent of Laurence of Arabia, Robert Capa captured this image of the French Camel Corps, the Meharists, riding through the desert to a battle in 1943. Life isn't made of stories that you cut into slices like an apple pie... We have to evoke a situation, a truth. This is the poetry of life's reality. For Capa, cinema provided a glamorous antidote to war and its horrors. He had been friendly with Ernest Hemingway since 1941, and the writer's connections allowed him to get to know Hollywood directors such as John Huston. Magnum had to make money, and its photographers had the skill and experience to tell behind-the-scenes stories about film stars and the locations not covered in agency handouts. Magnum photographers were observers of the world, and they brought a breath of fresh air to a world of gloss and touch-ups offering up a sterile notion of perfection. Th photographers' talent, coupled with Capa's network of movie contacts, meant the agency could offer exclusive spreads to major magazines like LIFE. 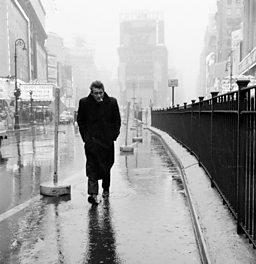 Magnum photographer Dennis Stock was introduced to the shy, nervy young actor James Dean by director Nicholas Ray. It was 1954, shortly before the release of East of Eden. Ray would direct Dean in Rebel Without a Cause the following year. With the impression that Dean had a small part in Eden, Stock went to a preview screening at the actor's invitation. He was blown away by the lead performance he saw, concluding that Dean exhibited the same star quality as Marlon Brando and Paul Newman. After hearing Dean talk nostalgically about his childhood in Fairmount, Indiana, where he had been brought up on his aunt and uncle's farm following his mother's death, Stock conceived a unique photo-essay that would explore the actor's origins. Eventually they would spend two months on and off together, initially around New York where this iconic image was taken in Times Square. Stock said, “I wasn’t interested in a lot of the poses Jimmy took. They were artificial, so I let him go through a lot of nonsense until he relaxed and became spontaneous. Then I took photos that I thought were revealing of his true character." After pitching up in Fairmount, Stock took many photographs around the farm and the town, where Dean was a minor celebrity due to having appeared in a few television dramas. 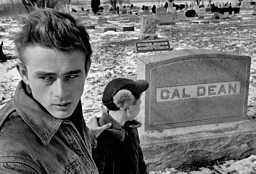 This image was taken in the town's Park Cemetery, with the young actor standing alongside his great-grandfather Cal Dean’s headstone. Just a few months later Dean would be buried here, alongside his mother and generations of his family. Dennis Stock was back in Hollywood after a stint in France, at the same time as Giant was wrapping up filming. James Dean invited him upstate for a weekend's driving in Salinas, Monterey County, but after initial enthusiasm he decided against going. Dean was killed in his new Porsche the next day. Salinas was the boyhood home of John Steinbeck and the setting for his novel East of Eden; Dean played the part of Cal in the movie. The Misfits was a pivotal moment in photographers' relationship with cinema. 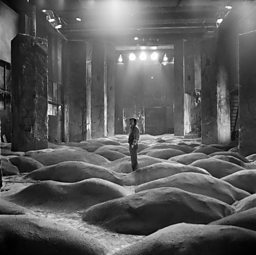 Lee Jones, Magnum's head of special projects in New York, decided that the film's dream cast deserved special attention. Nine different photographers took turns over 3 months of the shoot to capture the "total chaos" on what would be Marilyn Monroe's last film. 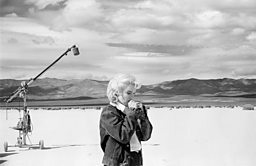 Eve Arnold, Magnum's first woman member, was Monroe's trusted collaborator. 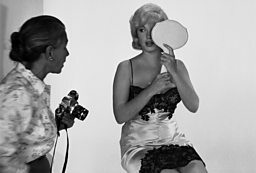 Having previously worked with Marlene Dietrich and Joan Crawford, she started photographing Monroe ten years earlier when they were both relatively unknown. She spent two months on the set of the John Huston movie. Photographer Bruce Davidson remarked, "Marilyn is really in torment - this was the movie where it all collapsed. And the hidden homosexuality, total neurosis, drugs, the whole works (on set). This film is a turning point, and the photographs document the disintegration of a system." Clark Gable had a heart attack the day after filming wrapped on The Misfits and died a few days later. With the advent of television, the movies lost much of their allure for the magazines and so it was the end of an era for Magnum. And when money became tight, producers said there was no need for a set photographer. Eyes turned to Swinging London and Europe's New Wave. 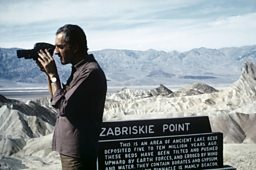 Directors had a different status, and photographing Truffaut or Godard was a different story from working in Hollywood. Magnum had to adapt to the new, scattered environment which had moved on from the centralising force of the studios. Pinkhassov managed to get some of his photographs in front of the director, and they ended up meeting. “He told me I could work around him if I wanted to... I asked his definition of photography and he said 'Cartier-Bresson'. I didn’t know who he was. That’s how he convinced me to be a reporter." BBC Four, Sunday 17 September, 22:00. This film recounts a remarkable collaboration, providing an essential history of both cinema and photography. 15 emotive photos from the Magnum vault. How well do you know British photography? From iconic moments of World War One to the polarising work of Martin Parr... take the quiz. 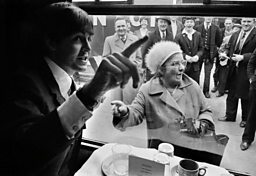 Photographer Eamonn McCabe on the football match where everything changed. Capturing the Oscars' golden moments with Marlon, Audrey and Jack. The stories behind 10 great rock photographs. How Danny Lyon changed photography. Rare photographs of the singer at the height of her career. How Jim Marshall shot the jazz festivals of the 1960s.